Issues of trust in your relationship can negatively affect the bond that you have with your romantic partner. Trust is so important for a committed relationship that it is almost the way we define what a relationship is. Basically, your partner in your relationship should be your closest friend, someone you can tell anything to without worrying about judgment. And your partner should be able to open up to you about anything also. If you’re reading this article, it might mean that you have picked up on some clues that your partner might not be telling you the whole truth. 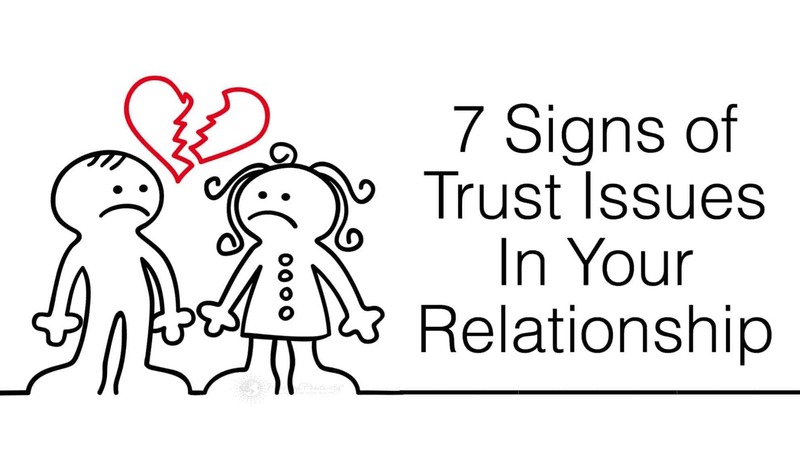 Maybe you are seeing things that aren’t really there, or maybe you’re seeing one of these 7 signs of trust issues in your relationship. Your partner has trust issues if they are not able to open up to you emotionally or if they are not supportive of your emotions when you need them to be. We pick up on subtle cues throughout our day. These could be a strange word used in conversation, a blink or eye twitch, or defensive body language that strikes us in our gut as odd. Later, often while we are preparing for sleep, we worry over these small details and wonder if the whole truth is being revealed when our partner talks to us. Not that you would track their movements around, but when your partner goes places, they never share with you where they’ve gone, what friends they were with, or if anyone made a pass at them while they were out. Your partner should give you the respect of giving you a brief description of their comings and goings without you while having to feel interrogated, and you should also feel able to be comfortable that they weren’t out having an affair. Is this a trust issue on your part or on your partner? Who isn’t trusting whom? This might be a relationship problem that requires the help of a licensed counselor to help you resolve things and open the lines of communication and trust. The last time something terrible happened to you, your partner was not there by your side lending emotional support. Or maybe you noticed that they brushed you off with a ‘That’s terrible’ but never offered a shoulder to cry on, let alone any help. When you have a problem, your partner should be your rock to rely on. They should have your back, but when you have trust issues in your relationship your partner may try to pull away from becoming emotionally involved. Your crisis is a time of high emotions, at least for you. For someone who isn’t able to open their heart and trust, it’s time to withdraw rather than show emotion. Lack of trust is a type of fear. You or your partner may fear being emotionally hurt, or hurt in other ways. When you trust someone with your heart, finances, etc. you are vulnerable to the potential that your partner may not act in your best interest. If your partner has been a cheater before, it could be a pattern of behavior and a sign that you might still need to deal with trust issues. A cheater is capable of change, but only if he or she wants to change the behavior. Your partner should be THE person you are talking to about anything that is troubling you. The problem here is that most likely, it is your partner’s behavior that is troubling you. Without trust in your relationship, you have probably already thought about how to find someone you can trust. Perhaps you confide in a trusted colleague at work, who you also happen to find attractive. Hopefully you aren’t on the outs, but if there are significant trust issues, you may notice that your partner is spending more time on caring for their appearance lately; new clothes, hairstyle, workout, etc. can all be signs that your mate is preparing to be back on the dating scene again.